There are a number of different reasons why digitization is desirable in today’s context. The primary advantage to digitization is it provides enhanced access to deteriorating or inaccessible collections. It makes it possible to bring together virtually related items the are separated physically. In certain cases, digitization can be used for information preservation and to conserve storage space. Finally, it can allow access from anywhere, at any time, and information sharing. 2. What is the importance of maintaining a digital archive of library materials? Libraries have an interest in and the ability to preserve the vast spectrum of documents and artifacts that might otherwise be lost to society. Many of our works are unique and priceless and will not be produced in the future. Others are in brittle condition and will eventually be lost if they are not preserved. Closer to home, digitization will capture the history and rich culture of our community, thereby adding to the treasure trove of information stored at HBCU libraries and archives. 3. What are the monetary costs associated with digitization? Digitization costs vary depending on whether projects are out sourced or completed in- house. Costs include equipment, staff, and space to house the operations. The biggest cost; however, are not in staffing, but in selection, preparation, metadata creation and maintenance over time. 4. Is scanning a violation of copyright law? It can be. Material that is in the public domain can be freely digitized. Copyrighted material can be digitized when it is permitted by one of the exemptions to copyright law (such as fair use or the limited exemptions available to libraries and archives), or with the permission of the copyright owner. 5. How will the Cornell digitization project affect the Library’s own preservation and digitization program? The preservation programs at most Alliance member institutions remain strong. The HBCU Library Alliance grant sponsored Cornell digitization project will strengthen the Library’s own preservation and digitization program. However, since it will be a number of years before we are able to digitize entire collections, digitization work continues to be very valuable in identifying items that will benefit from immediate attention. 6. Will each institution library put their digitized materials online? The images of libraries participating in the Cornell Project will be stored in a central repository located at Robert W. Woodruff Library of the Atlanta University Center. Each institution’s local digital collection will be accessible from that institution’s website and fall under local network infrastructures. Ownership of all documents will reside with each institution. 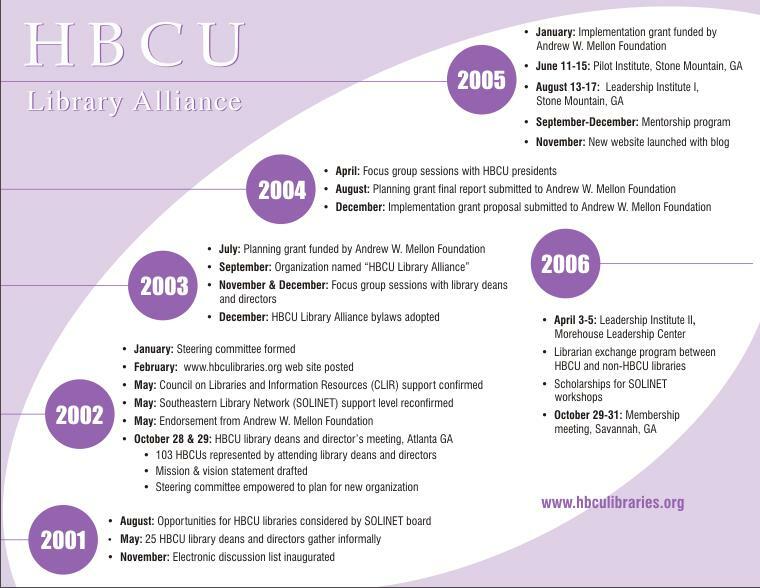 Although libraries are encouraged to participate in the HBCU Library Alliance digital archive, libraries may also choose to participate in individual or other cooperative digitization projects. 7. Are there recommended digitization vendors? The HBCU Library Alliance will not recommend vendors. However, the Alliance together with the Digitization Committee will review proposals from a list of qualified vendors. 8. What can we do with the digital objects we create? HBCU libraries may retain copies, reformat, provide access, and create revenue from any of the digital objects. 9. Are there content restrictions? What collections in the library should be digitized? There are no particular restrictions; however, one must consider the condition of the collection and whether there is an audience for their project, along with the collection’s breadth of appeal. 10. What if my original document and plans are mostly damaged, hardbound and in poor condition? They can still be digitized, except that you may have to compromise on the quality if the originals are deteriorated and are of inferior quality. 11. What are acceptable file formats? You can choose any of the standard digital formats, such as TIFF, JPG, GUF, PDF, etc. A frequently used format for printed materials is PDF, as it is the most portable format, has great printing control, and comes with a free viewer. Though, extensive manipulation may be necessary to get the small file size often associated with PDF’s. There are a wide variety of different possible file formats for digitized objects such as, text, images and audio. Relatively common file types include .wav or .mp3 for audio, .jpeg or .tiff for visual and textual files. When creating the digital objects it is important to incorporate our guidance provided in the standards and best practices for digitization, which can be found at http://hbculibraries.org/html/programs.html . 12. Is it possible to download and print digitized materials from the collection? Yes. Each institution will make decisions regarding downloading and printing costs associated with the process. 13. 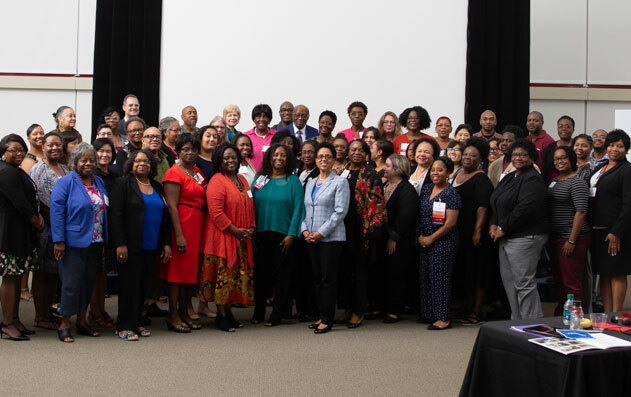 How does digitization advance the mission of the HBCU Library Alliance? We believe digitization is perfectly aligned with the mission and values of the HBCU Library Alliance. It is the very essence of the mission of great institutions to capture and preserve the sum of human knowledge and to make that knowledge widely available for the purpose of teaching, learning and scholarship. 14. Is it permissible for HBCU Libraries to recover costs and staff time? Yes. Many libraries assess fees for use to cover preservation costs and staff time. However we suggest that costs be reasonable and not viewed as a barrier to access. 15. Will we lose ownership of our digital images in our collaborative activities? No. 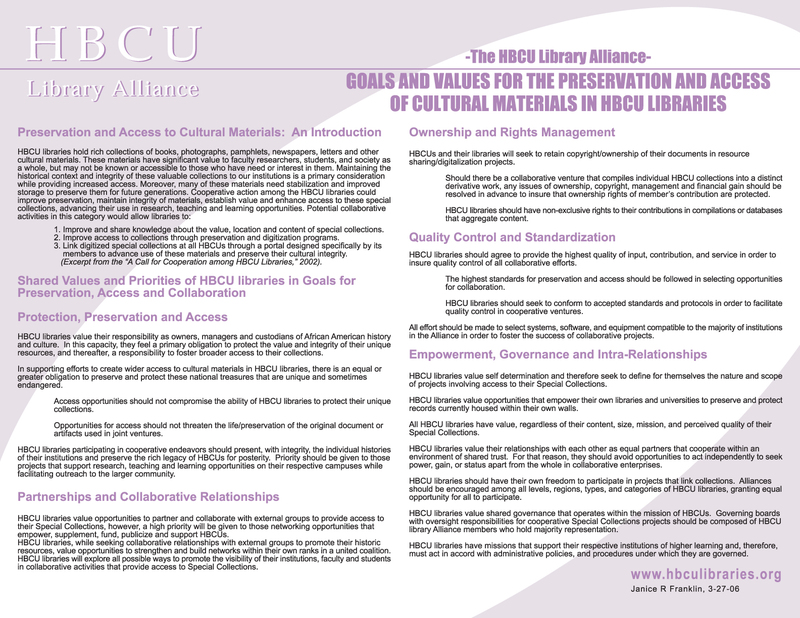 The HBCU Library Alliance has developed a Values Statement that will clarify issues surrounding ownership as we begin collaborative ventures. We value the right to maintain ownership of digital objects within the individual institution as a condition of participation in cooperative endeavors. The Values Statement is accessible online at: http://www.hbculibraries.org/docs/Values-for-Preservation.pdf.